whether you’re coming back from the 3.5 month break over the summer or the 1.5 month winter break, it can be hard to start up your routine again. i have a confession - i love syllabus week lowkey. not because we don’t have much work and can party every night (actually that’s a myth) but because it feels so good to open up a new notebook and planner. a new semester is a completely fresh start. new faces, new material, new routine. before i go back to school, i make sure i have all my school supplies ready. this list typically includes: a five subject notebook, my planner, sticky notes, colored pens, colored highlighters, sharpened pencils, pens and index cards. i always have all of these things in my backpack along with a calculator, iphone charger, gum, headphones and my laptop. if i’m taking four classes, i like to make sure i have at least 5 different colored pens and highlighters. one for each class and then an extra one for meetings, extracurriculars, etc. i’m pretty picky about my planners. i prefer to use a weekly planner (is has to have a monthly calendar view too) that has enough space for me to write all my assignments. whenever i’m feeling stressed, i just open it up and write down everything i have to do that week. i’m always writing my to do lists either for the day/week on my sticky notes and putting them in my planner. i also like to use sticky notes to remind myself of what i have for upcoming assignments so i can get a head start. like i said before, i color code my planner by classes and i try to highlight really important meetings or assignments. as soon as i get my syllabi from my professors, i put my assignments into my planner so that way i never miss a deadline. i recently listened to this podcast by rachel hollis that talked about auditing your calendar at the beginning of the year. she talked about how she writes in her calendar every day and then at the end of the year she goes back and analyzes all the things she liked and didn’t like about the past year. she goes way more in depth than that so if that sounds interesting, i would definitely check it out. all her podcasts are so insightful but that was one that stood out to me. anyways, that’s part of the reason why i try to write my day to day plan down. in addition to a planner, i use the calendar on my mac. personally i just think it is so easy and i love to plan out my day hour by hour so i know when i’m free. it sounds silly but it helps to look at it when i’m planning my week. doing this helps me with time management; for some people it might be stressful but for me its helpful. i also color code for this but i only use 3 different colors; one for class, one for work and one for everything else. i don’t put my assignments or anything in my mac calendar, i just use it to see what my day to day schedule is like. this is also helpful because it syncs to my apple watch so i can check my schedule on the go. okay i know i sound crazy but i also have a calendar hanging next to my desk at school. if you can’t tell, i’m obsessed with stationary (i have issues i know) and love an excuse to spend money on paper products. i bought this calendar to use specifically for my blog. i wanted to plan out when i would post certain blogs, giveaways, etc. i’m new to this aspect so i don’t have much to say about that other than i love calendars. one more thing i thought of - i have a separate journal dedicated to my new years goals and blog. there’s something about opening a journal and just staring at your goals in the face everyday. i use this journal to track my progress with my goals and to keep lists of things i can do that will help me achieve them. i think this is really important because i feel more inclined to actually work towards my goals. going off of all of this - it’s important to have a good desk space to work. 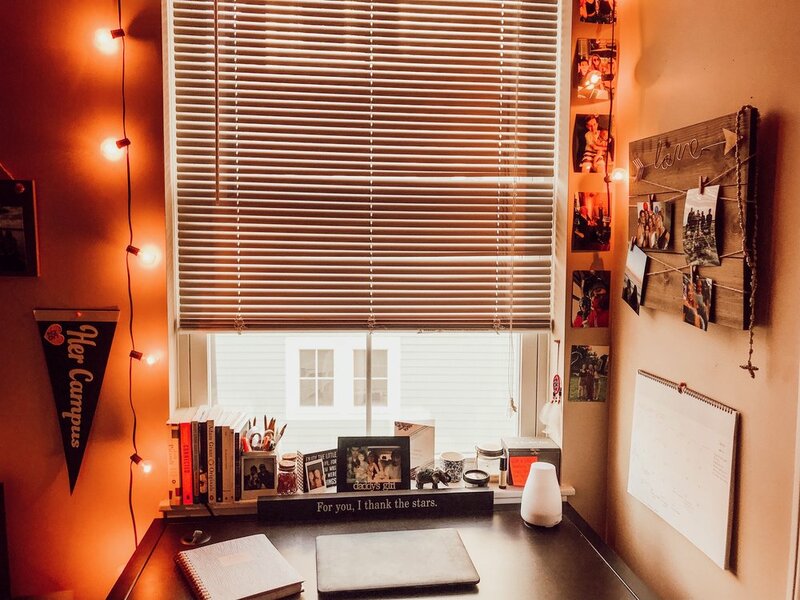 my desk in my apartment has my diffuser, pictures, candles, my books and journals, more school supplies, etc. if i have enough time in the morning, i like to sit at my desk, drink coffee and listen to a podcast while doing some work on my laptop. if i’m not doing that, i like to either take time to catch up on my reading or write in my journal. for me, this is an important part of my day because it gives me the motivation i need. i hope this helps! although it might seem overwhelming - i promise these little things make all the difference.